Retort Stand are Non-corrosive provide excellent replacement for the metal ones. Even the metallic rod has a polypropylene covering making it Non-corrosive. The rod measuring 12.5 mm x 750 mm can be screwed into the heavy base giving way to a perfectly stable Retort Stand. 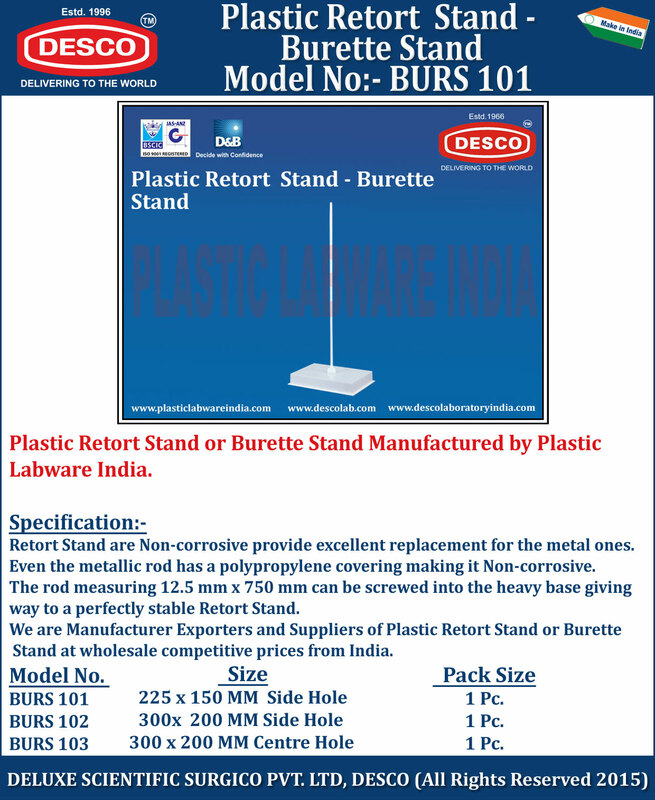 We are Manufacturer Exporters and Suppliers of Plastic Retort Stand or Burette Stand at wholesale competitive prices from India. BURS 101 225 x 150 MM Side Hole 1 Pc. BURS 102 300x 200 MM Side Hole 1 Pc. BURS 103 300 x 200 MM Centre Hole 1 Pc.